I'm so excited to finally bring you my first Iranian cooking tutorial. I've decided it's about time someone set about to veganizing some of the wonderful dishes of this cuisine, and it may as well be me! In this first installment, I will give you a recipe and step-by-step photos on how to make "zereshk polo ba morgh" a.k.a. 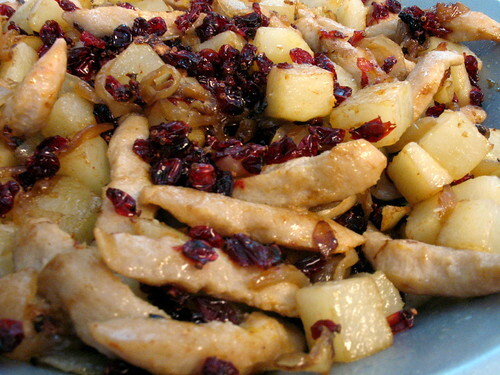 "rice pilaf with barberries and chicken" or should I say "chick'n". 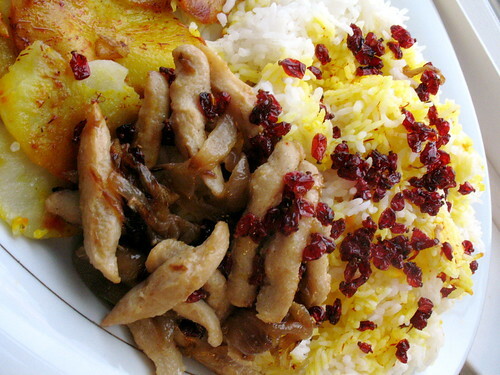 The reason I chose this dish is because it's an interesting and delicious one, and also touches on three important skills of Iranian cooking: rice, tah-digh (or the crispy rice or potatoes on the bottom of the rice pot), and caramelized onions. Finally, zereshk polo has been on my mind a lot lately as I've been trying to come up with an entry for this month's "Waiter there's something in my..." food event with the theme of pie. I thought, wouldn't it be crazy to take a traditional Iranian dish and put it in (the decidedly NOT traditional) pie form? My result was the "chik'n zereshk pot pie with saffron cream sauce" which I've saved for the end of this post. Click here to see what other food bloggers found in their pies this month: Waiter, there's something in my...pie! Hosted by the fabulous blog, Cook Sister! To cook the rice in true Iranian way, follow these instructions. 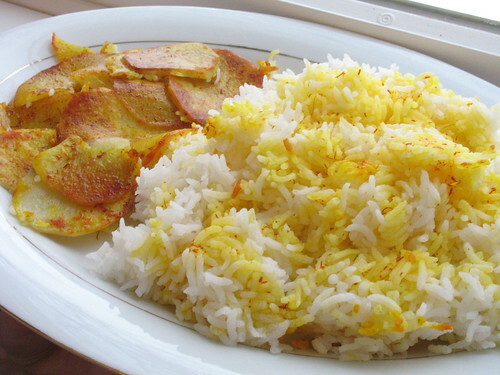 Iranian-style rice should be light and fluffy with seperate grains. 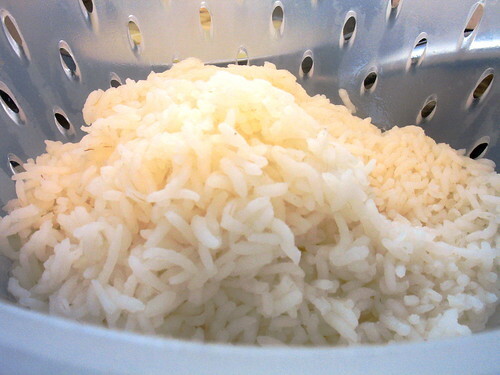 First, rinse the rice in cold water until the water runs clear. Use this as an opportunity to pick out any debris or discolored rice. Meanwhile, bring a large pot of salted water to boil. You don't need to measure the water, as you'll later drain the rice. 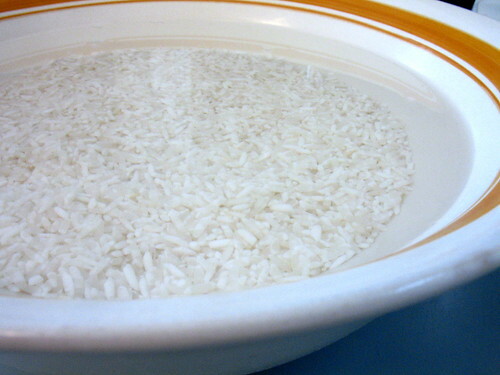 When water has come to a boil, drain soaking liquid from rice and add it to the pot. 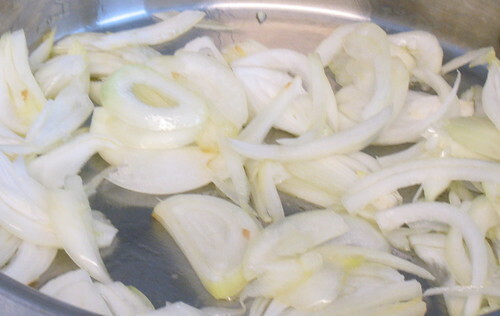 Let it cook at a gentle boil, uncovered, until "al dente"-i.e. the rice is still a little undone on the inside. Times can vary, but this only took me about 5 minutes, so keep a close eye. 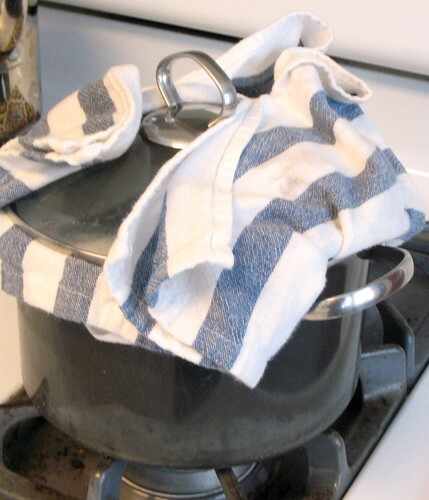 If you have a gas stove, be careful not to let the towel hang too low and be a fire hazard! At this point, turn the heat to low and let the rice cook/steam for about 20-25 minutes. Cook for the proper length of time according to what type of meat substitute you are using. 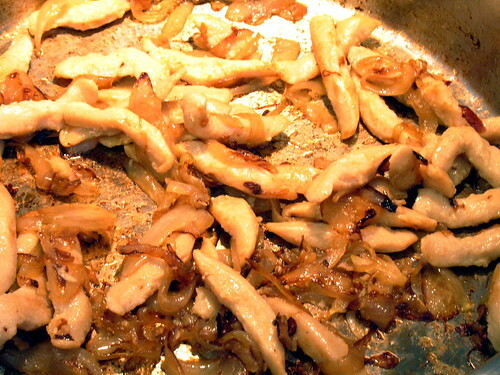 Chick'n strips are not meant to be cooked very long, so I just stirred them briefly with the onions before turning the heat off. Drain them of their soaking water, and sautee them with a mixture of oil and margarine and a little splash of saffron for about 5 minutes over medium-high heat, or until they release their aroma. Some Iranian cooks prefer to sautee zereshk with sugar to cut the tang, but I prefer leaving them as is. According to your tastes, you can try this with sugar of course. Next comes time for assembly! 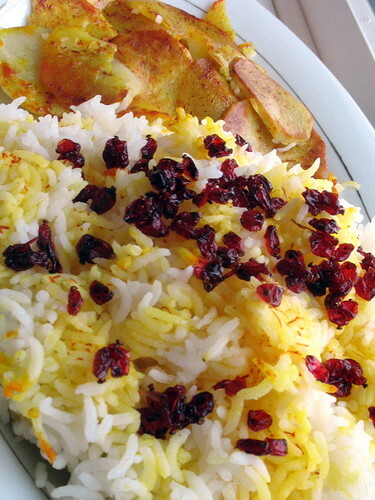 Next, by adding the barberries to the rice, you've gone from "polo" to "zereshk polo." 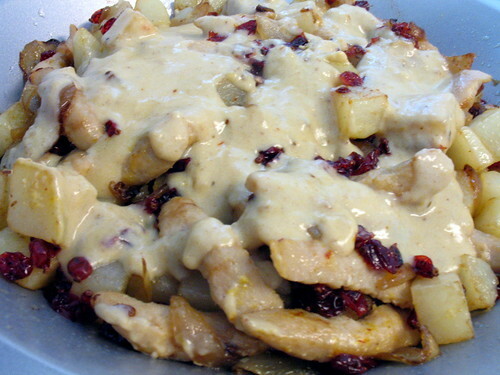 Next, by adding the chick'n/onion mixture, you've gone from having "zereshk polo" to having "zereshk polo ba morgh." Ta-da- you're done! Enjoy! Waiter, there's something in my...pie! "Chick'n Zereshk Pot Pie with Saffron Cream Sauce"
Crust: (I modified the basic pie crust recipe from James McNair's Favorites) This will make enough for two crusts, but this pie only needs one. You can make two pies, halve the recipe, or use one crust for something entirely different- it's up to you! Mix flour and salt together and pour into a food processor. Incorporate the shortening, the margarine, and the sour cream by adding about one tablespoon at a time and then briefly pulsing your food processor. After all the shortening, margarine and sour cream has been added, transfer the mixture into a large cold bowl. Sprinkle on ice water and gently blend dough until it comes together. Divide dough into two balls. Put each ball between two sheets of wax paper and roll gently until they are 5-inch discs of dough. 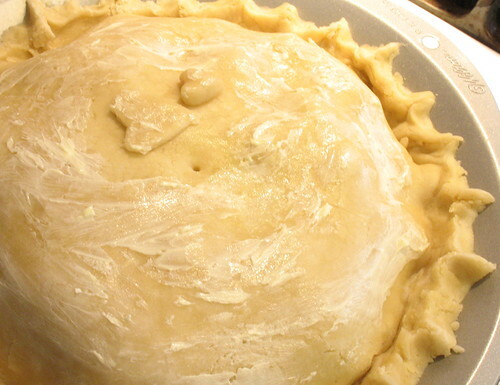 At this stage, refrigerate dough for at least 2 hours up to overnight. 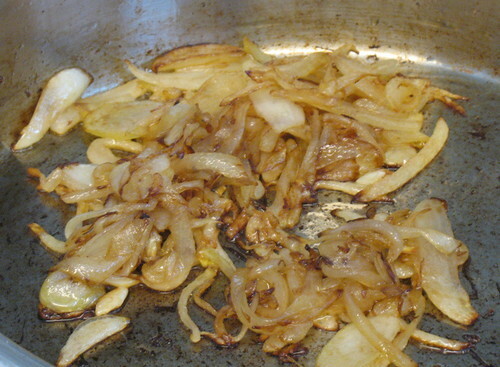 Fill a pie dish with a mixture of the chick'n, caramelized onions, sauteed potatoes, and sauteed zereshk. To make the sauce, melt margarine over low heat. Add flour gradually. Whisk constantly for about 2-3 minutes until you have a light roux. Gradually add the soymilk and continue to whisk until it has reached sauce consistancy, about 4-5 minutes. Turn off heat. Add a dash of saffron to the sauce. Pour over the mixture in the pie dish, and refrigerate until cool. (I couldn't resist putting little saffron-colored heart cut-outs on it!) Let pie cool for at least 10 minutes. Slice and serve. I really liked this pie. 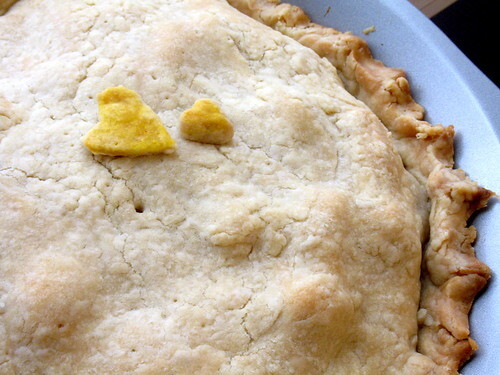 The extra-tender crust created the perfect contrast for the rich, fragrant filling. Enjoy! Help me! I see from your comments that most of you can't view the images in my last post. Blogger, of course, is no help at all. Has this ever happened to any of you? Do you have any suggestions for how to make the images come back? I can see the images on my home computers (in Firefox, Explorer, and Safari). I know some people can see the images (like my mom!) So what's the problem?? I got to eat really well while I was in New York City last week, and wanted to share two of the stand-out experiences with you. First up was Sacred Chow. I had been wanting to go here ever since reading about it on the fabulous blog Lifestyles of the Chic and Vegan. So the night after I got in, my friend Tony agreed to go with me. I was so tired of dealing with the hectic conference and the ferocious weather that I totally forgot that it was Valentine's Day! Tony and I noticed that everyone else there was a couple and that we should have probably gotten reservations, but oh well! I did not take any photos (so as not to further disturb the intimate Valentine's vibe!) but please hop over here to the above-mentioned blog to see what the food looks like. I got the tempeh reuben sandwich, and Tony got the orange BBQ seitan. I also had a glass of sangria. Let me tell you this sandwich was out of this world! Gooey melty vegan cheddar, tangy sauerkraut, perfectly marinated tempeh and of course a Russian dressing. I can still taste this sandwich! Next time I go back, if I can convince myself to order something different, I might peruse the tapas or the extensive dessert menu. Everything on the menu is clearly marked if it is gluten free, wheat free, and/or sugar free. You have got to check this cozy little bistro out! On Saturday, my friend Dorota was celebrating her birthday, so a big group of us went to Counter, a vegetarian and organic restaurant in the East Village. Let me just tell you, this place is amazing. It is definitely expensive, especially from my starving grad. student point of view, but the food and the presentation make up for it in creativity, taste, and sophistication. Oh, and most items on the dinner menu were vegan, and dishes with dairy were clearly marked. You could go for the wine, beer, and cocktails alone. Don't let the whimsical cocktail names like "angry lesbian" fool you, the selection of alcohol in this restaurant is serious and well thought-out. All the wines and liquors are either organic, bio-dynamic, sustainable, and/or kosher and marked as such clearly on the menu. The wine list was so long, and we enjoyed studying it just to learn about all these fabulous new wines and wineries we had not heard of. This was the bread that came to us as we pondered which appetizers to order. It was served with a dipping sauce that had olive oil, fresh basil, and chunks of tofu. It tasted much better than I can describe it! Here was a wild mushroom ravioli. A Parisian-style salad with goat cheese. (my dinner) An Italian farmhouse panini with a lentil-walnut pâté that was to die for, served with your choice of mesclun greens or frites. 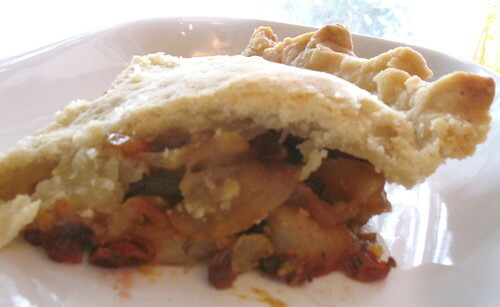 Vegetable B'Steeya, a Moroccan-inspired dish with phyllo dough encasing a filling of rice and pinenuts scented with saffron and orange-butter. 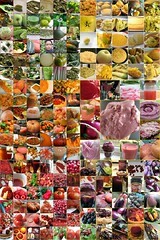 The vegetable tasting mosaic, which had little portions of artfully prepared vegetables such as braised fennel, maple sweet potatoes, eggplant, escarole, and much more. The orange sauce was a cumin emulsion, designed to go with the spiced quinoa. Here is Dorota blowing out her birthday candle, it was on a slice of swoon-worthy chocolate tart. Even if you are not going to be in New York City anytime soon, I encourage you to check out these restaurants' websites and menus. My partial descriptions can't do them full justice, they both exceeded expectations. And if you're going to be in NYC soon, take me with you! Mardi Gras is one of our all-time favorite holidays- it is so festive and redolent with meaning and tradition. Daiku went to college at Tulane University in New Orleans, and lived there for many years, so he has a special place in his heart for this holiday. As for me, one of the first picture books as a child was about Carnivale, so this holiday has long held fascination for me. One day, I'd like to partake in such famous Fat Tuesday celebrations as those held in Rio de Janeiro, Barbados, Venice, and yes, good old New Orleans. Most years, we throw a huge Mardi Gras bash. 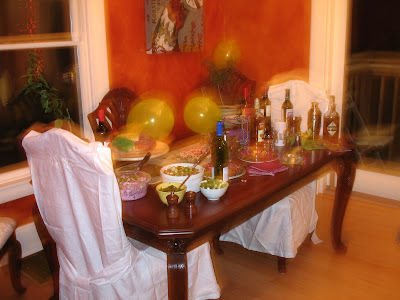 Unfortunately, this year the holiday falls at a hectic and busy time, so no party tonight. Boooo! We won't even be home in time to cook anything elaborate, but you can bet we will in the next few days! 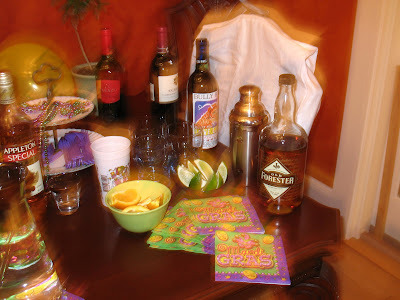 So instead, I thought I'd entertain you with some photos from last year's Mardi Gras party. Our table, filled with food and drinks galore. 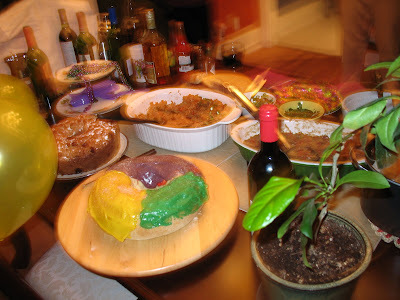 And a vegan king cake! I am forever grateful to Daiku for baking this yummy concoction. It is tradition to hide a little baby Jesus (king) in this cake, and whoever eats the piece with the king has to throw next year's party! This is a yeast cake that tastes like a cinnamon bun or stollen. 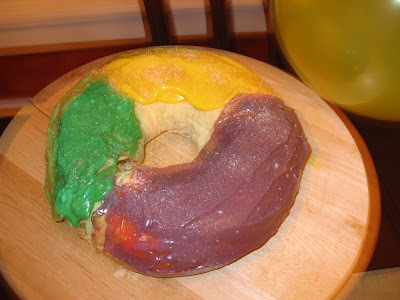 The frosting is a cream cheese one, colored with traditional Mardi Gras colors. Kathy's What do I know? The blizzard that would hit the city the next day. (Above you see the New York City Public Library) I had never seen such miserable conditions, and I'm sure a lot of people all accross the country feel the same way. The city of New York, in its infinite wisdom, decided not to plow or shovel the snow. As I commuted from the Bronx to midtown Manhattan every day, I slushed through brownish snow sludge. Guess what? My boots were not waterproof! On a cold Saturday, I slushed my way to MooShoes to meet Sarah Kramer and have her sign a book for my cousin. Sarah was such a sweetie! Here are the cupcakes, cookies, and brownies that accompanied Sarah's appearance. After grabbing my autograph and a ginormous cupcake, (and browsing fab vegan shoes) I headed next door to one of my all-time favorite bookstores, Bluestockings. It is a "radical bookstore, fair-trade cafe, and activist center", owned and run by some awesome people, with a great selection of books and journals. I grabbed a coffee to go with my peanut butter cupcake, grabbed some books on state repression and whatnot, and relaxed in the warm and cozy cafe. With the bookstore mascot curled up next to me. She is possibly the cutest puppy in the world. With these opportunities for nourishing the mind, soul, and tummy, a little bone-chilling below-freezing face-numbing cold is o.k., right? 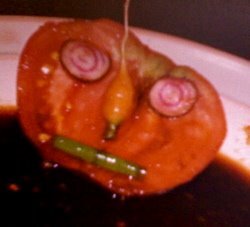 I was so glad that Susan came up with this idea to showcase lovely, healthy, vegetable-filled goodies for Valentine's day. This gave me a chance to come up with some recipes that Daiku and I could enjoy tonight, since we will be apart on the actual holiday! (I have to go to a conference in New York City this week. Booo) Click on Susan's blog, Fatfree Vegan Kitchen, to see other bloggers' contributions to this event. I decided to play on the theme of "hearts" and "absence"--i.e. vegetables that we don't get to enjoy that often, and came up with these 2 dishes. Pre-vegan, one of my all-time favorite meals was ceviche, a Latin American dish made of fish or seafood "cooked" using acid such as citrus juice. I noticed that hearts of palm, when sliced, bear a striking visual and textural resemblance to calamari! Try this refreshing and heart-healthy ceviche for a taste and texture experience. Toss all ingredients together and marinate for a few hours. Serve cold, garnished with slices of lime and cilantro leaves. So many hearts! Add to that the red of the lettuce and blood orange, and the heart-healthy boost from blackberries, and you have got one lovely salad! To make dressing, heat balsamic vinegar over low heat until reduced by half. Different vinegars will vary in how long they take, but your final result should coat your spoon. 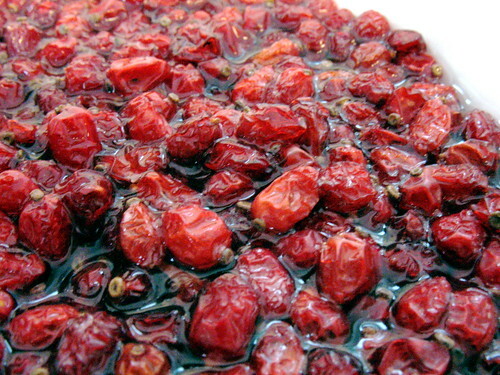 Stir constantly, be careful not to let the vinegar burn. Take off heat. Puree blackberries in a blender, and strain juice into vinegar. Add reserved orange juice and stir. Turn heat back on low, and stir ingredients until combined. If it is too tart for your taste, add a little honey or agave nectar to taste. Arrange lettuce leaves, add hearts of palm, artichoke hearts, blood orange segments, and drizzle with dressing. These two dishes, along with some potato salad, comprise our dinner tonight. Tomorrow, I'm off to New York for a week. I will be back to blogging by this weekend. Enjoy! Have a great V-day, everyone. Tonight, we walked to a vegan potluck sponsored by SARO (Syracuse Animal Rights Organization). This was a fun, cozy way to spend a chilly evening. Borscht with sour cream- mmmm! Simple sauteed bok choi- super mmmm. We took the pumpkin-oatmeal cookies from Vegan with a Vengeance. These are great for potlucks, because you can make them in advance and they only improve with time. It was cool that so many people showed up. 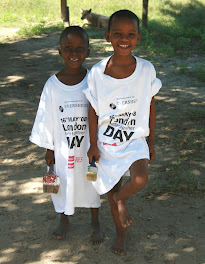 Thank you Andy and everyone who threw this potluck- we hope to participate in this and more SARO events in the future! Call 866-59-VEGAN (Toll Free) for more information. The Committee on Women and Art and SARO. The demo starts at 7pm sharp so don't be late. This is our first post-detox food round-up. (For those keeping track, we went about 4 or 5 weeks). Lately, I have been thinking about these food round-ups, and have decided to take them in a new direction rather than have them become repetitive or boring. Because of our detox, I've been thinking a lot--I think too much-- about limits and what I "can't" or "shouldn't" have. But that's not really my style. While I found the detox to be beneficial and enlightening, I'm ready to get back to the mode of celebrating food. No more forbidden foods or obsessing about ingredients, calories, or categories. 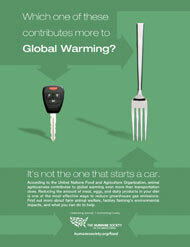 So, what's a vegan foodie to do instead? Something I've been promising you for a long time. For the next weeks and months, I'm going to devote myself to veganizing Iranian recipes. It will be a good way to get out of my normal kitchen habits, and to celebrate both veganism and my heritage. Starting with next week, each friday in addition to other note-worthy foods from the week, I will bring you at least one Iranian dish. Last weekend, we had dinner at our friends' house. As always, they were beyond accomodating and cooked us this vegan feast, courtesy of a Moosewood restaurant cookbook: rice with black beans, topped with a mango salsa, with a coconut curry corn side dish. This dinner made us forget the freezing temperatures for a while! As a thank you, we took dessert. This was my first cupcake baking expedition in a long time. These were heavenly chocolate mint cupcakes with a chocolate mint ganache from "Vegan Cupcakes Take Over the World." We could not get enough. This has become a regular in our house: a hearty vegetable soup with miso broth, served over udon noodles. I think potatoes and miso are a match made in heaven. I had a sweet potato, some black beans, and not much more in the house. So this recipe from Albion Cooks was perfect. I modified it a bit, and finished it off in the oven, but the basic combination of sweet potatoes, potatoes, black beans, greens, olives and salsa is difficult to beat. some stuffed grape leaves (we make sure to specify vegetarian), falafel patties with tahini/cucumber sauce, and fresh pita bread. Nothing is more satisfying than tearing off a piece of hot fluffy bread and dipping away. Breakfast tofu scramble- I really don't make this often enough! The scramble had tofu, onions, garlic, and capers and was colored by a bit of turmeric. It was topped with avocados, scallions, and lime juice, and served with toast and salsa. 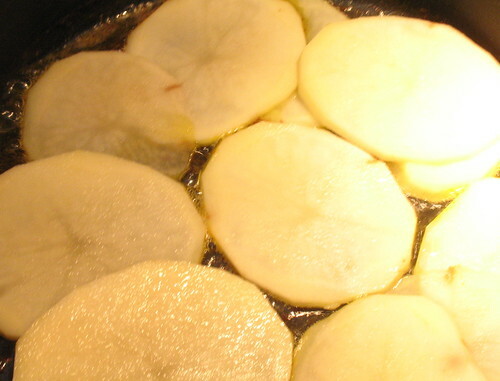 Some Indian-style skillet potatoes and peas. A simple and satisfying dinner. Can you tell I'm on a potato kick lately? Finally, a gratuitous kitty shot. Here are Marble and Bijou, chillaxing on the sofa. Can you believe that they are sisters and the same age? Marble looks so much smaller than Bijou! It boggles the mind. Hope your weekends are warm and happy!